The game text is in Spanish(I think) and there are only two levels. 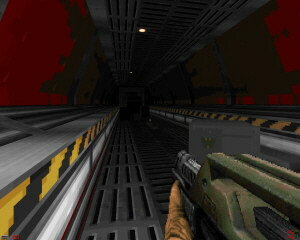 You don’t need Doom2 to play this, you just download and unzip. As far as I can tell it’s just a demo. If anyone reads Spanish(? ), you can check out original thread over at Pryotecto-Yautja. Mess with the Predalien, you get the mandibles. You can find the whole thing, all of Justin's TC at DOOMSDAYHQ. http://www.doomsdayhq.com/ Can't be seeing Aliens TC. Here's part of the second post: CONFIGURATIONS AND CONTROL OF THE GAME: Before nothing. I have formed the game of a certain way and the comfortable way but, asi that here a summary of the controls of the game: - To advance: it shoots with an arrow upwards directional - To back down: it shoots with an arrow downwards directional - To move laterally towards the right: right directional key - To move laterally towards the left: left directional key - To jump: button mouse 3 (straight) - To shoot: button mouse 1 (left) - To recharge the weapon: R (Important, quedarte without bullets and darte do not count can be mortal. Charge whenever you have few bullets, to do it when you have to a Xeno surrounds can suppose a safe death.) - To use/To activate: space - To crouch itself: Right Crtl - To aim/To move: mouse - To change of weapon: keys from the 1 to the 3, rotating key of mouse VARIABLE OPTIONS: In the main menu (to which podeis to accede tansolo at any time pressing the key ESC of the game) is the section of options, where there are several sub-sections of contrlol of movements, sounds, resolution of screen, options of player and muchisimias but. I hope that it has served as aid! - Here I put a pair of captures, in case not habeis seen the one of the main page, in the news: ~~~~~~~~~~~~~~~~~~~~~~~~~~~~~ Sorry for some words looking weird, but this is the best translator I have to use. Oooooo, I'm soooooo downloading this right now!!! Interesting mod, though it's very tough, even on the easiest level. The two maps start off fun, but going through corridor after corridor gets boring. Go onto the site itself hicks, *Slider* and two other have different version dpeending which version of jdoom is used.